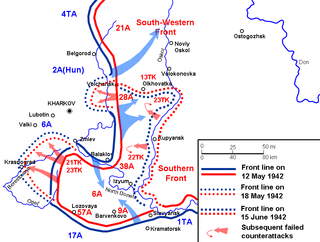 For the Second Battle of Kiev, see Battle of Kiev (1943). The First Battle of Kiev was the German name for the operation that resulted in a very large encirclement of Soviet troops in the vicinity of Kiev during World War II. This encirclement is considered the largest encirclement in the history of warfare (by number of troops). The operation ran from 7 August to 26 September 1941 as part of Operation Barbarossa, the Axis invasion of the Soviet Union. In Soviet military history, it is referred to as the Kiev Strategic Defensive Operation, with somewhat different dating of 7 July – 26 September 1941. Much of the Southwestern Front of the Red Army (Mikhail Kirponos) was encircled but small groups of Red Army troops managed to escape the pocket, days after the German panzers met east of the city, including the headquarters of Marshal Semyon Budyonny, Marshal Semyon Timoshenko and Commissar Nikita Khrushchev. Kirponos was trapped behind German lines and killed while trying to break out. The battle was an unprecedented defeat for the Red Army, exceeding even the Battle of Białystok–Minsk of June–July 1941. 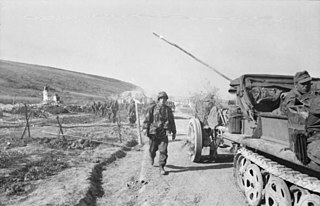 The encirclement trapped 452,700 soldiers, 2,642 guns and mortars and 64 tanks, of which scarcely 15,000 escaped from the encirclement by 2 October. The Southwestern Front suffered 700,544 casualties, including 616,304 killed, captured or missing during the battle. The 5th, 37th, 26th, 21st and the 38th armies, consisting of 43 divisions, were almost annihilated and the 40th Army suffered many losses. Like the Western Front before it, the Southwestern Front had to be recreated almost from scratch. After the rapid progress of Army Group Centre through the central sector of the Eastern front, a huge salient developed around its junction with Army Group South by late July 1941. On 7–8 July 1941 the German forces managed to break through the fortified Stalin Line in the southeast portion of Zhytomyr Oblast, which ran along the 1939 Soviet border. By 11 July 1941 the Axis ground forces reached the Dnieper tributary Irpin River (15–20 km (9.3–12.4 mi) to the west from Kiev). The initial attempt to enter the city right away was thwarted by troops of the Kiev ukrep-raion (KUR, Kiev fortified district) and counter offensive of 5th and 6th armies. Following that the advance on Kiev was halted and main effort shifted towards the Korosten ukrep-raion where was concentrated the Soviet 5th Army. At the same time the 1st Panzer Army was forced to transition to defense due to a counteroffensive of the Soviet 26th Army. A substantial Soviet force, nearly the entire Southwestern Front, positioned in and around Kiev was located in the salient. By the end of July the Soviet front lost some of its units due to the critical situation of the Southern Front (6th and 12th armies) caused by the German 17th army. While lacking mobility and armor due to high losses in tanks at the Battle of Uman on 3 August 1941, they nonetheless posed a significant threat to the German advance and were the largest single concentration of Soviet troops on the Eastern Front at that time. Both Soviet 6th and 12th armies were encircled at Uman where some 102,000 Red Army soldiers and officers were taken prisoners. On 30 July 1941, the German forces resumed their advance onto Kiev with the German 6th army attacking positions between the Soviet 26th army and the Kiev ukrep-raion troops. On 7 August 1941 it was halted again by the Soviet 5th, 37th, 26th and supported by the Pinsk Naval Flotilla. With the help of the local population around the city of Kiev along the 45 km (28 mi) frontline segment were dug anti-tanks ditches and installed other obstacles, established 750 pillboxes, planted 100,000 of mines. Some 35,000 soldiers were mobilized from local population along with some partisan detachments and couple of armored trains. On 19 July Hitler issued Directive No. 33 which would cancel the assault on Moscow in favor of driving south to complete the encirclement of Soviet forces surrounded in Kiev. However, on 12 August 1941, Supplement to Directive No. 34 was issued, and it represented a compromise between Hitler, who was convinced the correct strategy was to clear the salient occupied by Soviet forces on right flank of Army Group Center in the vicinity of Kiev before resuming the drive to Moscow, and Halder, Bock and Guderian, who advocated an advance on Moscow as soon as possible. The compromise required 2nd and 3rd Panzer Groups of Army Group Centre, which were redeploying in order to aid Army Group North and Army Group South respectively, be returned to Army Group Centre, together with the 4th Panzer Group of Army Group North, once their objectives were achieved. Then the three Panzer Groups, under the control of Army Group Center, would lead the advance on Moscow. Initially, Halder, chief of staff of the OKH, and Bock, commander of Army Group Center, were satisfied by the compromise, but soon their optimism faded as the operational realities of the plan proved too challenging. On 18 August, OKH submitted a strategic survey (Denkschrift) to Hitler regarding the continuation of operations in the East. The paper made the case for the drive to Moscow, arguing once again that Army Groups North and South were strong enough to accomplish their objectives without any assistance from Army Group Center. It pointed out that there was enough time left before winter to conduct only a single decisive operation against Moscow. On 20 August, Hitler rejected the proposal based on the idea that the most important objective was to deprive the Soviets of their industrial areas. On 21 August Jodl of OKW issued a directive, which summarized Hitler's instructions, to Brauchitsch commander of the Army. The paper reiterated that the capture of Moscow before the onset of winter was not a primary objective. Rather, that the most important missions before the onset of winter were to seize the Crimea, and the industrial and coal region of the Don; isolate the oil-producing regions of the Caucasus from the rest of the Soviet Union and in the north, to encircle Leningrad and link up with the Finns. Among other instructions, it also instructed that Army Group Center is to allocate sufficient forces to ensure the destruction of the "Russian 5th Army" and, at the same time, to prepare to repel enemy counterattacks in the central sector of its front. Hitler referred to the Soviet forces in the salient collectively as the "Russian 5th Army". Halder was dismayed, and later described Hitler's plan as "utopian and unacceptable", concluding that the orders were contradictory and Hitler alone must bear the responsibility for inconsistency of his orders and that the OKH can no longer assume responsibility for what was occurring; however, Hitler's instructions still accurately reflected the original intent of the Barbarossa directive of which the OKH was aware of all along. Engel in his diary for 21 August 1941, simply summarized it as, "it was a black day for the Army". Halder offered his own resignation and advised Brauchitsch to do the same. However, Brauchitsch declined, stating Hitler would not accept the gesture, and nothing would change anyhow. Halder withdrew his offer of resignation. On 23 August, Halder convened with Bock and Guderian in Borisov (in Belorussia), and afterwards flew with Guderian to Hitler's headquarters in East Prussia. During a meeting between Guderian and Hitler, with neither Halder nor Brauchitsch present, Hitler allowed Guderian to make the case for driving on to Moscow, and then rejected his argument. Hitler claimed his decision to secure the northern and southern sectors of western Soviet Union were "tasks which stripped the Moscow problem of much of its significance" and was "not a new proposition, but a fact I have clearly and unequivocally stated since the beginning of the operation." Hitler also argued that the situation was even more critical because the opportunity to encircle the Soviet forces in the salient was "an unexpected opportunity, and a reprieve from past failures to trap the Soviet armies in the south." Hitler also declared, "the objections that time will be lost and the offensive on Moscow might be undertaken too late, or that the armoured units might no longer be technically able to fulfill their mission, are not valid." Hitler reiterated that once the flanks of Army Group Center were cleared, especially the salient in the south, then he would allow the army to resume its drive on Moscow; an offensive, he concluded, which "must not fail". In point of fact Hitler had already issued the orders for the shift of Guderian's panzer group to the south. Guderian returned to his panzer group and began the southern thrust in an effort to encircle the Soviet forces in the salient. The bulk of 2nd Panzer Group and the 2nd Army were detached from Army Group Centre and sent south. Its mission was to encircle the Southwestern Front, commanded by Budyonny, in conjunction with 1st Panzer Group of Army Group South under Kleist, which was driving up from a southeasterly direction. Following the crossing of Dnieper by German forces on 22 August 1941, the city of Kiev came under threat of complete encirclement and the command of the Southwestern Front appealed to the Stavka to allow withdraw forces from Kiev. However the permission to do so was not received until 17 September 1941 when the encirclement was completed at Lokhvytsia in Poltava region. The Panzer armies made rapid progress. On 12 September, Kleist's 1st Panzer Group, which had by now turned north and crossed the Dnieper river, emerged from its bridgeheads at Cherkassy and Kremenchug. Continuing north, it cut across the rear of Budyonny's Southwestern Front. 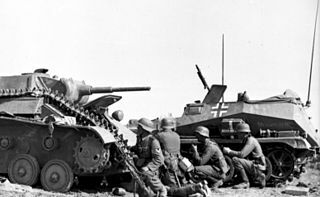 On 16 September, it made contact with Guderian's 2nd Panzer Group advancing south, at the town of Lokhvitsa, 120 miles east of Kiev. Budyonny was now trapped and soon relieved by Stalin's order of 13 September. After that, the fate of the encircled Soviet armies was sealed. With no mobile forces or supreme commander left, there was no possibility to effect a break out. The infantry of the German 17th Army and 6th Army of Army Group South soon arrived, along with 2nd Army (also on loan from Army Group Center and marching behind Guderian's tanks). They systematically began to reduce the pocket assisted by the two Panzer armies. The encircled Soviet armies at Kiev did not give up easily. A savage battle in which the Soviets were bombarded by artillery, tanks and aircraft had to be fought before the pocket was overcome. By 19 September, Kiev had fallen, but the encirclement battle continued. After 10 days of heavy fighting, the last remnants of troops east of Kiev surrendered on 26 September. Encircled became several Soviet armies, 5th, 37th, 26th, and separate detachments of 38th and 21st armies. The Germans claimed 600,000 Red Army soldiers (up to 665,000) captured, although these claims have included a large number of civilians suspected of evading capture. During withdrawal from Kiev, on 20–22 September 1941 at Shumeikove Hai near Dryukivshchyna (today in Lokhvytsia Raion) perished several members of headquarter staff Mikhail Kirponos (commander), Mikhail Burmistenko (member of military council), and Vasiliy Tupikov (chief of staff). Some 15,000 Soviet troops managed to break through the encirclement. German sentinel in the citadel of Kiev on 19 September. By virtue of Guderian's southward turn, the Wehrmacht destroyed the entire Southwestern Front east of Kiev during September, inflicting 600,000 losses on the Red Army, while Soviet forces west of Moscow conducted a futile and costly offensive against German Army Group Center near Smolensk. These operations, such as the Yelnya Offensive, were conducted over very bad terrain against defenders in fortified strong points, and nearly all of these counter-offensives ended in disaster for the Red Army. As a result of these failed offensives, Red Army formations defending Moscow were seriously weakened. With its southern flank secured, Army Group Center launched Operation Typhoon in the direction of Vyazma in October. Over the objections of Gerd von Rundstedt, Army Group South was ordered to resume the offensive and overran nearly all of the Crimea and Left-bank Ukraine before reaching the edges of the Donbas industrial region. However, after four months of continuous operations his forces were at the brink of exhaustion, and suffered a major defeat in the Battle of Rostov (1941). Army Group South's infantry fared little better and failed to capture the vital city of Kharkov before nearly all of its factories, skilled laborers and equipment were evacuated east of the Ural Mountains. 107,540 Soviet personnel were awarded the Medal "For the Defence of Kiev" from 21 June 1961. Immediately after World War II ended, prominent German commanders argued that had operations at Kiev been delayed and had Operation Typhoon been launched in September rather than October, the Wehrmacht would have reached and captured Moscow before the onset of winter. Heinz Guderian and Fedor von Bock in particular fiercely argued that the "diversion" to Kiev would have dire consequences if the operation dragged on for too long. Winter was coming in a few weeks, and if Moscow was not taken before the first snow, the entire operation would bog down in the mud. Indeed, this is what happened. David Glantz argued, however, that had Operation Typhoon been launched in September, it would have met greater resistance due to Soviet forces not having been weakened by their offensives east of Smolensk. The offensive would have also been launched with an extended right flank. Glantz also claims that regardless of the final position of German troops when winter came, they would have still faced a counteroffensive by the 10 reserve armies raised by the Soviets toward the end of the year, who would also be better equipped by the vast industrial resources in the area of Kiev. 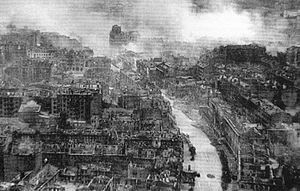 Glantz asserts that had Kiev not been taken before the Battle of Moscow, the entire operation would have ended in a disaster for the Germans. ^ a b Glantz 1995, p. 293. ^ a b Liedtke 2016, p. 148. ^ a b Krivosheev 1997, p. 260. ^ Read 2005, p. 731. ^ Krivosheev 1997, p. 114. ^ Glantz 2011, pp. 54–55. ^ a b Clark 1965, p. 130. ^ Clark 1965, p. 101. ^ Glantz 2011, p. 55. ^ a b Glantz 2011, p. 56. ^ Glantz 2011, p. 57. ^ Glantz 2011, p. 60. ^ a b c d Glantz 2011, p. 58. ^ a b Glantz 2011, p. 59. ^ Guderian 1952, p. 200. ^ Guderian 1952, p. 202. ^ Clark 1965, pp. 111, 139. ^ Clark 1965, p. 133. ^ Clark 1965, pp. 135, 141. ^ a b c Glantz 2001, p. 23. Glantz, David (2001). The Soviet–German War 1941–1945: Myths and Realities: A Survey Essay. Archived from the original (PDF) on 22 July 2017. Retrieved 21 July 2016. Clark, Alan (1965). Barbarossa: The Russian–German Conflict, 1941–45. London: William Morrow and Company. Liedtke, Gregory (2016). Enduring the Whirlwind: The German Army and the Russo-German War 1941–1943. Helion and Company. ISBN 978-1910777756. Moritz Albrecht Franz Friedrich Fedor von Bock was a German field marshal who served in the German army during the Second World War. Bock served as the commander of Army Group North during the Invasion of Poland in 1939, commander of Army Group B during the Invasion of France in 1940, and later as the commander of Army Group Center during the attack on the Soviet Union in 1941; his final command was that of Army Group South in 1942. Nikolai Fyodorovich Vatutin was a Soviet military commander during World War II. Vatutin was responsible for many Red Army operations in Ukraine as commander of the Southwestern Front, the Voronezh Front during the Battle of Kursk and the 1st Ukrainian Front during the liberation of Kiev. He was ambushed and mortally wounded in February 1944 by the Ukrainian Insurgent Army. Günther Adolf Ferdinand von Kluge was a German field marshal during World War II who held commands on both the Eastern and Western Fronts. He commanded the 4th Army of the Wehrmacht during the invasion of Poland in 1939 and the Battle of France in 1940, earning a promotion to Generalfeldmarschall. Kluge went on to command the 4th Army in Operation Barbarossa and the Battle for Moscow in 1941. 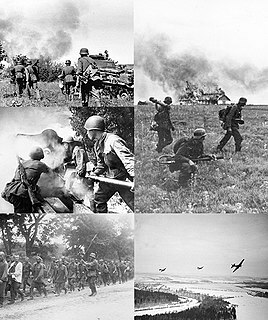 The First Battle of Smolensk was a battle during the second phase of Operation Barbarossa, the Axis invasion of the Soviet Union, in World War II. It was fought around the city of Smolensk between 10 July and 10 September 1941, about 400 km (250 mi) west of Moscow. The Wehrmacht had advanced 500 km (310 mi) into the USSR in the 18 days after the invasion on 22 June 1941. The German army encountered unexpected resistance during the battle, leading to a two-month delay in their advance on Moscow. Case Blue was the German Armed Forces' name for its plan for the 1942 strategic summer offensive in southern Russia between 28 June and 24 November 1942, during World War II. The 9th Army was a World War II field army. It was activated on 15 May 1940 with General Johannes Blaskowitz in command. The Battle of Rostov (1941) was a battle of the Eastern Front of World War II, fought around Rostov-on-Don between the Army Group South of Nazi Germany and the Southern Front of the Soviet Union. The Battle of Uman was the German offensive operation against the 6th and 12th Soviet Armies — under the command of Lieutenant General I. N. Muzychenko and Major General P. G. Ponedelin, respectively. The battle occurred during the Kiev defensive operation between the elements of the Red Army's Southwestern Front, retreating from the Lwow salient, and German Army Group South commanded by Field Marshal Gerd von Rundstedt, as part of Operation Barbarossa on the Eastern Front during World War II. The Soviet forces were under overall command of the Southwestern Direction, commanded by Marshal Semyon Budyonny, which included the Southwestern Front commanded by Colonel General Mikhail Kirponos and Southern Front commanded by General Ivan Tyulenev. The battle finished by the encirclement and annihilation of 6th and 12th armies to the southeast of the Uman city. The Yelnya Offensive was a military operation by the Soviet Army during the Battle of Smolensk during Operation Barbarossa, the German invasion of the Soviet Union, which began the German-Soviet War. The offensive was an attack against the semi-circular Yelnya salient which the German 4th Army had extended 50 kilometres (31 mi) south-east of Smolensk, forming a staging area for an offensive towards Vyazma and eventually Moscow. Under heavy pressure on its flanks, the German army (Heer) evacuated the salient by 8 September 1941, leaving behind a devastated and depopulated region. As the first reverse that the Heer suffered during Barbarossa and the first recapture of the Soviet territory by the Red Army, the battle was covered by Nazi and Soviet propaganda and served as a morale boost to the Soviet population. The Battle of Białystok–Minsk was a German strategic operation conducted by the Wehrmacht's Army Group Centre under Field Marshal Fedor von Bock during the penetration of the Soviet border region in the opening stage of Operation Barbarossa, lasting from 22 June to 9 July 1941. Operation Kutuzov was the first of the two counteroffensives launched by the Red Army as part of the Kursk Strategic Offensive Operation. It commenced on 12 July 1943, in the Central Russian Upland, against Army Group Center of the German Wehrmacht. The operation was named after General Mikhail Kutuzov, the Russian general credited with saving Russia from Napoleon during the French invasion of Russia in 1812. Operation Kutuzov was one of two large-scale Soviet operations launched as counteroffensives against Operation Citadel. The Operation began on 12 July and ended on 18 August 1943 with the capture of Orel and collapse of the Orel bulge. The Battle of Bryansk was a twenty-day battle during World War II conducted in the Bryansk Oblast as a part of the overall Moscow campaign. Returning from the Kiev operation, Heinz Guderian attacked in an unexpected direction capturing Bryansk and Oryol with few casualties thereby encircling two Soviet formations, the 13th Army and 3rd Army. A third Soviet formation, the 50th Army was encircled by infantry of the German 2nd Army north of Bryansk. However the encircled Red Army units continued fighting, delaying the drive on Moscow for two weeks. This delay, as well as the casualties taken by the Wehrmacht liquidating the pockets contributed to the German collapse at the gates of Moscow. See also: Vyazma and Bryansk pockets. As a result of this battle, the Germans occupied Bryansk until they were expelled by the Red Army on September 17, 1943 as a part of the Smolensk campaign. Operation Roland was a local German offensive inside the Soviet Union during the Second World War on the Eastern Front, and was conducted as a local operation within the overarching German summer offensive, Operation Citadel, on the southern side of the Kursk salient. The German forces of the III Panzer Corps and the 2nd SS Panzergrenadier Division Das Reich of the II SS Panzer Corps attempted to envelop and destroy Soviet forces of the Voronezh Front. This operation was necessitated by the failure of the German II SS Panzer Corps to break through Soviet forces during the Battle of Prokhorovka on 12 July. Therefore, German commanders decided to first link up the III Panzer Corps, which had been lagging behind due to heavy Soviet resistance, with the II SS Panzer Corps, in order to consolidate the German positions into a continuous frontline without inward bulges and enable the two panzer corps to overrun Soviet forces defending Prokhorovka together. The linking up of the two German pincers was planned to effectuate the envelopment of the Soviet 69th Army and other supporting units.